Hi, I am interested in your 1987 Chevrolet C/K Truck (stock #4866-CHA) listed on Autotrader for $22,995. I'd like to get more information about this vehicle and confirm its availability. 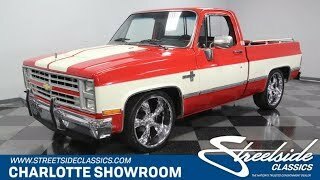 This 1987 Chevrolet Silverado is a great mix of classic style, distinctive upgrades, a ton of usability. So when a truck can standout and still get the job done, you know youve found an impressive total package. We bet youve never seen a Silverado quite like this before. After all, not only do you get the two-tone red and white running down the sides, but also the white SS-style stripes on the hood make for a truly bold first impression. And as you get closer, you notice the details work is quite well done, including a gray pinstripe to provide a distinct dividing line for the two colors. Plus, this truck has a ton of bright work. You see it on factory pieces like the bumpers and wide tow mirrors, as well as bold upgrades like the bed rails and the large Coys 22-inch alloys. While the cowl bulge in the hood adds some sporty flair, the trailer ball in the rear and full bed mat are nice reminders that this Silverado still knows how to earn its keep. Inside is some classic style with some nice upgrades. Silverados were the premium line during this era, so its nice to have features like power windows, power locks, and a tilt steering column. The black and gray cloth bench seat is comfortable, its supplemented with extra style on the tartan headliner and matching lower door panels. This truck has the sliding rear windows to really let you get the old-school breezes. Plus, youll want to have all the windows down when you hear the upgraded AM/FM/CD stereo with full subwoofer sound system. Under the hood are more great custom touches on the 305 cubic-inch V8. After all, those Chevy orange valve covers look like they are radiating from within the dark black engine bay. Plus, the V8 has been upgraded for substance with a Holley four-barrel carburetor, Edelbrock intake, and MSD ignition. This full package was made to enjoy the open road. Thats why you have power steering, front disc brakes, and a four-speed automatic transmission w/highway-friendly overdrive. There are even dual fuel tanks to enjoy the long haul. This is a cool vintage truck with truly memorable style. So if you want great looks with plenty of usefulness behind it all, call today!